Hi, this is my first thread and I hope I will open many more threads, as and when my experience and knowledge increases. Main purpose of this thread is to record my trades done using pivot and vwap concept. I would also post here my trading plan which will include my thoughts on psychology , money management and other topics which I feel is useful for trading. First of all, I would like to extend my sincere thanks to all those who have directly or indirectly helped me in trading. 1. Josh1 , TracerBullet, Snake.Head,joydeep and others who have developed rtd,excel files,backfill tools etc, (which is distributed freely), thus enabling me to use amibroker for technical analysis(TA) . 2. Subhadip sir for the "new way of pivot trading", which truly is the foundation of TA. 3. Pratap sir (and all others who posted in the thread)for the vwap and his detailed explanation of the concept. 4. Smart_trade sir for 'how to trade failures and rejections", and many other countless posts and words of wisdom. 5. 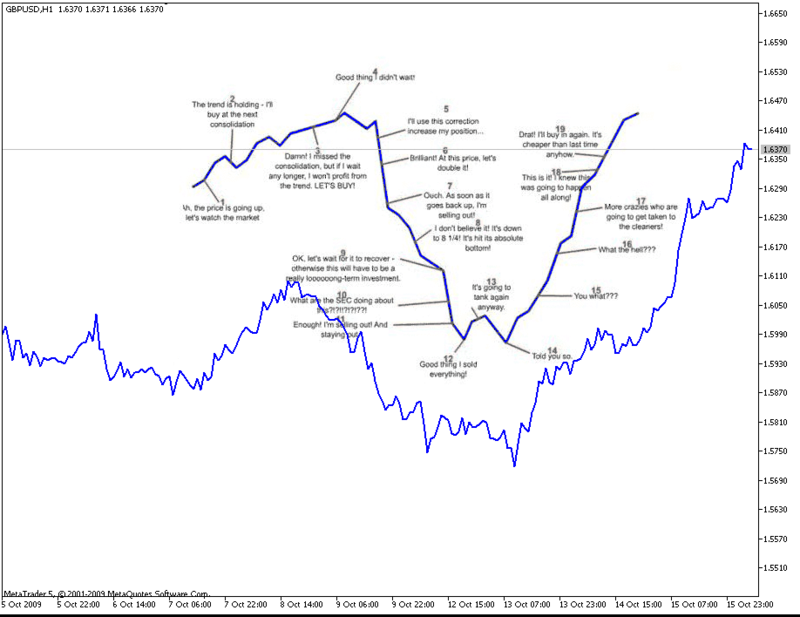 Vivektrader for the beautiful summary of 2Ma system, and all others who have participated in the pivot thread. 6. Amitrandive,XRAY27,wisp,howardroark,suri112000 and many others who have posted useful articles, which I recommend everyone to read. How do we make consistent profit in The Market? How? Let me give you my own example. I have a specific strategy for positional / long term trading. In this strategy, if D candle closes above 10 EMA, I keep buying, till the time latest D candle closes above 10 EMA and above previous D candle H. Reverse is true for Short entries. Once the market moves about 30 - 45 pips in my favour, I move SL to BE and forget the trade. I do not have targets for these trades as I’m aiming Infinite profits, beyond 700 – 1000 pips. And I keep moving my SL with every 100 pip increment. and I keep buying and selling as well, depending on where D candle closed with regards to 10 EMA. Supposing, at the end of 50 trades (2 calendar months), I have about 30 buy trades (at various profits) and 20 sell trades (at various profits). Now, if my sell trades start hitting my SL, my buy trades start galloping as I have large buy trades and I start stacking buy trades all over again. On the other hand, if my buy trades start hitting my SL, my large sell trades start galloping and I start adding to my sell trades. Do you get the picture? Power of PARTICIPATION. Market goes up, I’m there. Market reverses, I’m there. I’m there at every important juncture to be part of a small swing, big swing, the trend and the counter trend. I’m just participating. I’m a passenger, in all the journey, possible. The market is neither Random nor “ZERO SUM GAME”. Irrespective of the strength of our analysis, we cannot dictate the market. This week’s trend will become counter trend next week and by the time we realise it, it will start retracing again. Take a Weekly chart of any pair and observe there will be few value/s / zones, where price never reached again, in the nearest past. This being the case and when that can happen over and over and over again and again, I want to be in the market when that BIG SWING / TREND starts and I want to be at the LOWEST DIP and at the HIGHEST RALLY, possible. And this is possible when I keep participating in the market. Participating at lowest business cost is our edge. Participating is more important than winning, because the more we participate, the more chances we give ourselves to win more. Being Constant is not to be confused with "consistency". Consistency is necessary when trading, however, when I use the word "constants", I am referring to the opposite of "variables". Please allow me to explain. Occasionally while driving in town, you might have an animal run out in front of you. I've found through the years that if you start swerving from left to right in an attempt to miss the animal and at the same time the animal begins to run left and right in order to miss you, you will invariably run over it. Why? You have two variables trying to dodge each other and neither one knows where the other is going. However, if you make it a practice to slow down and continue to drive straight, the animal will dodge your tires and run to safety. What you did was become a "constant" to allow the animal to dodge you. This may be a bad illustration, but the world of trading works the same way. Since the market moves as without any certain rhyme or reason, WE must become the "constant" because the market (price) is certainly without question, the variable. So rather than chase an unpredictable set of time and events, we wait (as a constant) planning our strategy around this unpredictability. take more time and more knowledge than we anticipated. AS THEY REALISE WORK IS INVOLVED. understand that our success is in us, not the methodology. hesitating in executing our rules. results of our trades when we don't follow the rules. and we begin to work on knowing ourselves better. continues to grow as we increase our contract size. may drop back to Step 4. and start 'climbing' the steps again. I think I m close to step 21. "We feel we are very close to crossing that threshold of successful trading." Also step 22 requires to take responsibility for trades. So I hope a trading diary here serves the purpose. Without a doubt, the hardest thing about Day Trading is just getting through the personal learning curve before crashing and burning. A "learning curve“ is the time and effort required by an individual to acquire and become proficient in a new skill. Day trading is definitely a complex skill and is not easy. It requires a lot of work, dedication and continuous exposure to the market before you can develop the self-control necessary to be profitable on a regular basis. Remember, most day traders go broke or quit within the first year. The knowledge of day trading does not come overnight. You wouldn't expect to become a chess master after playing a few games with a friend. It might take a hundred matches for the complexity of the game to finally start to sink in and several hundred games to truly master the strategies. Day Trading is game of chess that you play with the market, only the stakes are higher, you are using money to play the game! There is a lot to Day Trading. You must master complex analysis & strategies that help you time your entries and exits and the mechanics of order placement. You must develop consistency, patience, self-control, and an analytical mind, so that you can learn and improve from your failed trades and mistakes in money management. You have to overcome boredom, laziness and sloppiness. go onto strive for higher and higher profits in your trading. But it has to be done is a strict and controlled manner or it can quickly lead to disaster. If you really want to become a profitable day trader and not just another trader that gets kicked by the market then you will have to adopt the following trading plan. Get through the day trading learning curve without going broke first! The plan is designed to walk you along in baby steps and protect you from the number one threat to your day trading career…yourself! Everyone should start at Beginning Day Trader Level 1. It doesn't matter if you have a 40,00,000 account to trade, you will still want to start out at square one and EARN your way, step by step to Expert Day Trader Status. 2 consecutive weeks reaching Min. Weekly Profit Target Advances you to the next level. 2 consecutive weeks with a net loss for the week, gets you Demoted back to the previous level. 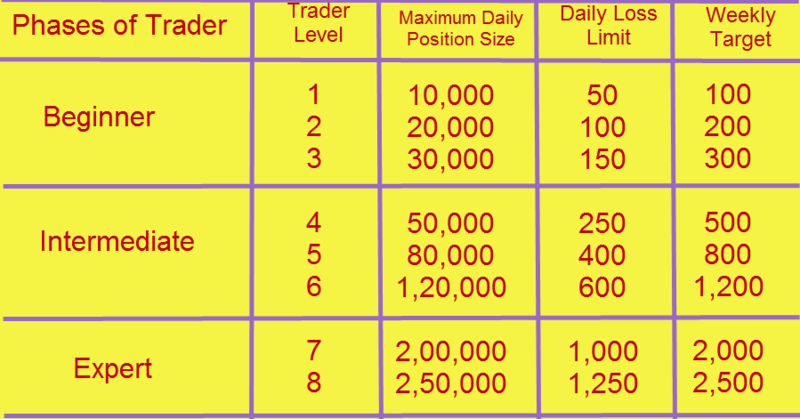 Max Daily Position Size: This is the maximum amount that you can have in 1 or more trades at the same time intra-day. For example, at Level 1, you can trade more than 10,000 cumulatively throughout the day over a series of trades but never more than 10,000 at any one given time. This max position size will keep your losses on any one trade that moves against you to minimum and easier to deal with. Daily Loss Limit: This is the maximum amount that you can lose during a given trading day. If you hit your Daily loss limit at any time during the day you MUST QUIT trading with real money. You can watch the market and paper-trade all you want, but no more live trading! If you lose your daily loss limit on one or several trades, then things are not going in your favor that day. The Daily loss level will keep you from turning into a “get even -vengeance trader” for the remainder of the day which can easily triple and quadruple your initial smaller losses adding insult to injury. Minimum Weekly Target: This is the minimum profit goal that you must achieve two weeks running to advance to the next level. It is a relatively conservative profit goal, as a good day trader could easily make the entire weekly target in a single trading day using the restrictions of the Max. Daily Position Size at that level. The idea is to get yourself finishing the week without big losses and with an acceptable profit -consistently before becoming more Aggressive. one Std Dev covers 68.2% of the trades around VWAP and two std dev covers 95.5%. but around VWAP to +1SD to -1SD both buys and sellers will be fighting= sideways. +2SD and -2SD being close to 95% of range becomes overbought and oversold zones for some pullback buy unless +1SD / -1SD is violated one side is still strong. +ve bias above -1SD day level. Buy pbs upto -1SD day levels and 3min/15min bands. BD of -1SD day could mean a pb to VAH and then depends what it does there. -ve bias below +1SD day level. Sell pbs upto +1SD day levels and 3min/15min bands. BO of +1SD day could mean a pb to VAL and then depends what it does there. Note: Rules of the above strategy is quite exhaustive and I have included only few points. Will update my strategy as and when my experience increases. First confirm Higher time frame candle close above both MAs, no need of MA cross. Exit: at a visual pivot (entirely or part profit booking, rest may be trailed or kept till end of day), known resistance. Don't enter in previous afternoon range (unless you are Subhadeep ) afternoon roughly means after European market opens i.e. Being a trend based system, only enter when in clear trend. Why are you planning the contrary and in which scripts?